There are so many first class "Soul of Vietnam" songs left to be discovered. 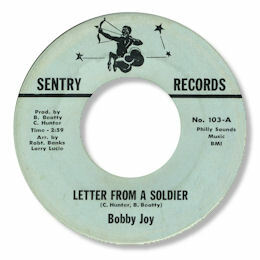 Bobby Joy's Letter From A Soldier is one that really should be more widely appreciated. Taken at a funereal pace this song is well summed up in the title and Joy's sadness and loneliness "on the other side" is palpable. The organ and piano set up a strong church feel beautifully. The names of Larry Lucie and Robert Banks (not mentioned in the Tangerine issue) mean that this 45 was recorded in New Jersey or New York. Note ~ Special thanks to my good friend Greg Burgess for the suggestion. His knowledge and understanding of the "Soul of Vietnam" is astonishing.